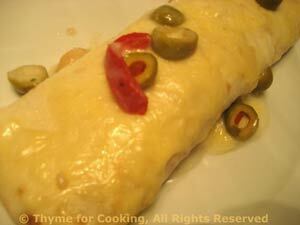 Tuna and White Bean Enchiladas, Weekly Menu Planner. You could use shredded turkey or chicken in these as well as the tuna. I use Gruyère cheese but Colby or Cheddar would be equally good. The green olives work well with both the tuna and the sauce, rounding out the flavors. 15 minutes to assemble, 20 to bake!